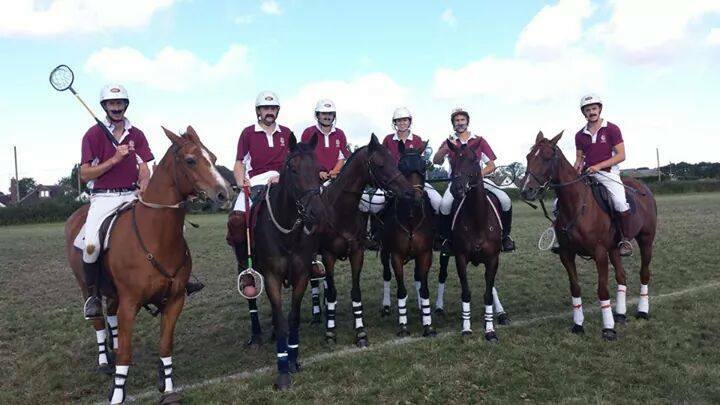 Midland tournament took place on the 9th and 10th of August and saw one glorious day of high quality polocrosse before heavy and persistent rain stopped play on the Sunday and the organisers decided to cancel rather than risk any hair raising moments. However, in some the grades it was still possible to determine some clear leaders after the first day of play and these were duly awarded the prizes along with best numbers and best horse prizes. Arden put in some razor sharp displays as they claimed the B and Upper C grades as they beat all comers on their home ground but Kent Target claimed the A grade after the Welsh Dragons did them a favour by defeating Cotswold in the last game of the day. However, despite this defeat Cotswold still managed to grab second place by a whisker, based on their higher goal difference. Prizes couldn’t be awarded in the Lower C or the Junior grades as these were in pools but Rugby claimed another D grade with a combined Pennine/Northern Lions team in second place. However, they had a close shave as they had to rely on goal difference to do it after Chiltern beat them in their second match of the day but then Chiltern in turn lost to the Pennine/Northern Lions by a greater goal difference and so didn’t feature in the places themselves. In the E grade it was a mixed team of players who managed to combine to defeat Limemere Sparks to claim the win. In the Primary Juniors it was Rockwood Harriers who claimed the top spot with Rugby in second place as the teams warmed up for the Pony Club Polocrosse Championships the following weekend. One good thing about the cancellation was that it looked fairly likely to happen by Saturday evening and so a lot of the players took the opportunity to let their hair down at the Saturday night party.